In this article I will test the Waterfield Club Cycling Pouch, a vertically oriented pouch designed with ELEVEN vélo that is optimized for packing cycling tools and phone in your back jersey pocket with minimal bulk. Protecting your smartphone during rainy conditions in spring, fall and winter is key. Furthermore you want to take some essential tools, cash and a spare home key with you on the road. Lets find out if the Waterfield Club Cycling Pouch can pack it all in a clever way that keeps your ride comfortable. Until now I have been using the Lockbox Wallet to take essential cash, my health insurance card and a spare home key with me during a ride. I pack my smartphone in a cheap zip-lock bag, while I keep my essential repair tools and a spare tire in compact saddle bag. So basically I take three “bags” with me on the road. The Club Cycling Pouch version I’ve ordered is made from black ballistic nylon, which is the same material used for bullet-proof vests. This is very tough and durable material, which Waterfield has been using for other products like the Waterfield Sleevecase or Waterfield Dash Sleeve. On the front side there is a leather black patch with the Waterfield logo on it. A premium YKK self-locking zipper keeps the top opening from the vertically oriented Club Cycling Pouch waterproof. 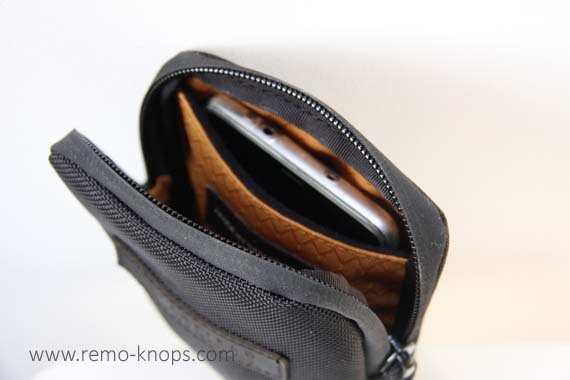 Competitive products like the Rapha Essentials Case or Bellroy All-Conditions Phone Pocket have a different type of zipper that runs completely around the long side of the pouch. 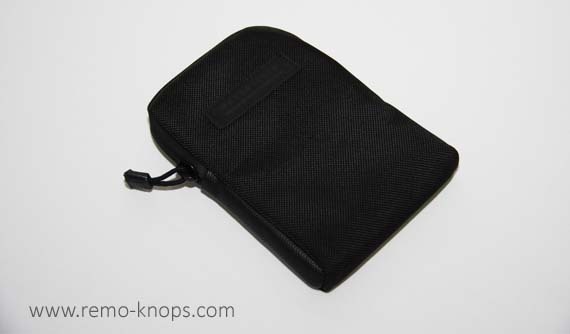 In the side view of the Club Cycling Pouch you can see a rubber-like material that has some stretch. The orange/gold liner, the YKK zipper and the rubber-like material are perfectly sewn together. No “open spots” where water potentially could enter, and this detail speaks for the high quality finish of the product. First the phone compartment that easily fits my Xiaomi Redmi Note 3 smartphone. The phone compartment has soft plush inner surface and a good volume of impact resistant compression foam that will protect the screen of your smartphone. Even if you will put essential repair tools in the main compartment, the screen of your smartphone is well protected. Second the main compartment for tools and all other necessities. The essential cash, my health insurance card and a spare home key easily fit the main compartment. A spare tire, Topeak Micro Airbooster with CO2 cartridge, Tacx Mini Tyre Levers, 11-speed KMC Missing Link, and the Lezyne V10 multi-tool easily fit the main compartment. The internal compartments feature the well known Waterfield orange/gold liner. The only improvement in the design that I would love to see is an extra card pocket within the main compartment that could keep health insurance card, paper cash and my spare home key in place. This would even increase the organization of tools and essentials. However in practice I keep paper cash and health insurance card in the phone compartment, while I put my spare home key in the main compartment. The design of the Cycling Club Pouch is a brilliant collaboration between San Francisco based Waterfield and Australian Cycling Clothing Manufacturer ELEVEN vélo. The price-point of the Waterfield Cycling Club Pouch is $49,– which doesn’t sound particularly cheap. You can buy a lot of zip-bags for that amount. However compared to Rapha Essentials Case or the Bellroy All-Conditions Phone Pocket the price-point is good. Waterfield makes very robust and durable products, and the owner brings his experience as a bike messenger to the table. The Bellroy All-Conditions Phone Pocket is more stylish and has some more organized pockets, but it doesn’t allow you to pack essential tools. The Rapha Essentials Case doesn’t have a water resistant YKK zipper. Personally I think the Cycling Club Pouch even beats Waterfields own Club Ride Pouch in terms of value and features for money. The Waterfield Cycling Club Pouch can replace your cycling wallet, your saddle bag and the zipper that protects for smartphone. You get a high quality and durable product designed by cyclists for cyclists. Please check out Tim Wiggins review with pictures of the brown canvas Waterfield Club Cycling Pouch. Hey!, I found this information for you: "Club Cycling Pouch review – Waterfield + Eleven Velo". 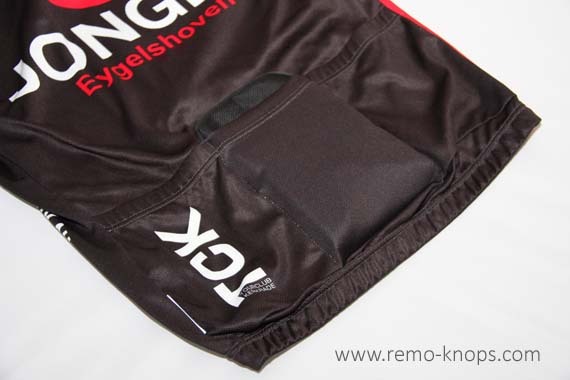 Here is the website link: https://www.remo-knops.com/5533/club-cycling-pouch-review/. Thank you.